The Illinois Tollway has integrated INVEST throughout its processes and is using all three INVEST modules to improve the sustainability of its fifteen-year, $12 billion capital program, Move Illinois. The Illinois Tollway institutionalized the use of the Project Development Module of INVEST in its processes by identifying key decision points, responsible parties, actions, timelines, and templates for implementing INVEST. These processes are explained in the Illinois Tollway’s INVEST Project Development Manual. The Illinois Tollway also modified their Design Section Engineer’s Manual and their Construction Manager’s Manual to include a discussion of the INVEST program, requirements for implementation, and references to the Illinois Tollway’s INVEST Project Development Manual. INVEST evaluation to identify identify potential sustainable solutions. INVEST evaluation to determine target INVEST score. INVEST Evaluation to determine as-designed INVEST score. Design engineer hands off project to construction manager. Construct sustainable solutions and use sustainable practices. INVEST evaluation to determine as-constructed INVEST score. The planner, design engineer, and construction manager use an INVEST scorecard and INVEST tracking form to keep track of progress towards sustainability goals at each milestone. For Illinois Tollway’s System Planning and Operations and Maintenance programs, the agency instituted a program-level process for improving sustainability. This process begins with setting goals, evaluating the program using the corresponding INVEST module, and conducting quality control for consistency. The subsequent steps are analyzing scores, identifying opportunities to improve, implementing programmatic improvements, and reporting. The Illinois Tollway developed supplemental text to add to the existing INVEST Project Development criteria and developed some of their own criteria based on Tollway-specific needs. The supplements incorporate additional best practices and scoring elements into the INVEST criteria. Some are specific to the Tollway, while others come from other sustainability rating systems, including the Illinois Livable and Sustainable Transportation (I-LAST) Rating System and Greenroads. I-LAST and INVEST are complimentary in that the sustainable practices included in the checklist-style I-LAST framework can be utilized to demonstrate potential methods to achieve the outcome-focused INVEST criteria. For instance, for INVEST criterion PD-18 Site Vegetation, INVEST provides one to three points for minimizing maintenance and irrigation, using native vegetation, or having a long-term vegetation plan. The Illinois Tollway supplement adds additional opportunities for points based on I-LAST components. These actions that have been found to be successful in Illinois. The Illinois Tollway added criteria in areas they felt were important to the Tollway, but that were not already covered by the national-level INVEST. These included criteria such as regional employment, which was not appropriate at the national level, as well as criteria related to goals that are important to the Tollway’s service area, such as visual aesthetics and light pollution. The Tollway also developed a criterion for the incorporation of innovative sustainable roadway design or construction practices to allow for the use of cutting edge technology and encourage the development of new methods. Any practices applying for credit under this criterion must be approved by the Tollway, and points are assigned on a sliding scale depending on the magnitude and duration of the sustainability benefit. The Illinois Tollway has been actively managing its environmental program for many years, increasing efforts to “Build Green” since the agency launched its 10-year capital program, the Congestion-Relief Program (CRP), in 2005. The Illinois Tollway used INVEST to try to baseline their efforts on the work in years past and compare them to the current program. To provide a baseline measurement of the sustainability of the Illinois Tollway’s System Planning program, the Tollway used the INVEST System Planning module to score Illinois Tollway funding programs for four baseline years. 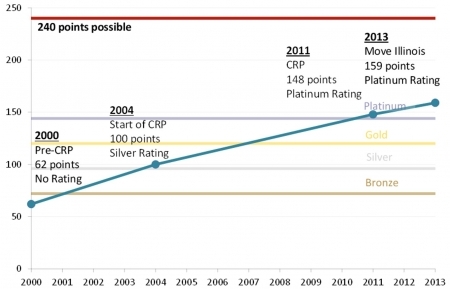 As shown in the graph below, each score showed steady progress on sustainability over the 13 years evaluated, and the scores in recent years are highly accomplished, achieving a Platinum rating in 2011 and 2013. The Illinois Tollway has increased its sustainability since the year 2000, when it scored 62 points, to the present, where the Move Illinois capital program received a score of 159 points. The Illinois Tollway’s method of evaluating criteria for which they do not have full authority provides a potentially useful example for other agencies in similar circumstances. For several INVEST SP criteria, the Tollway shares responsibilities with CMAP, the MPO for the area. For these criteria, the Tollway scored the criteria as if it performed the action if both agencies were collaborating financially, contributing data to the process or using data from the process in question. Similarly, the Illinois Tollway used the INVEST Operations and Maintenance module to score Illinois Tollway programs for four baseline years. 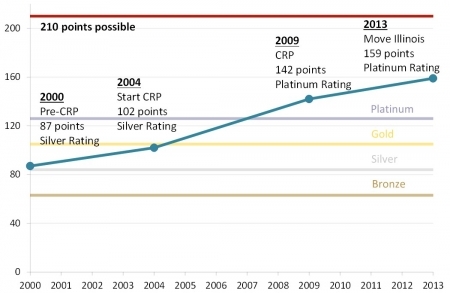 The Illinois Tollway found steady sustainability progress on the operations and maintenance side as well, with scores improving from 87 points in 2000 (a Silver rating), to 159 in 2013 (Platinum rating). To provide a Project Development scoring baseline, the Illinois Tollway scored 22 projects constructed between 1998 and 2012, ranging in cost from $400,000 to $134 million. Projects were roughly equally distributed amongst bridge, asphalt, and concrete project types. Additionally, the Illinois Tollway evaluated 15 completed Move Illinois projects, included in its current capital program, for comparison against the baseline. These projects were constructed in 2013-2014. Because different projects used different scorecards, and therefore had different potentials for points, scores in the Project Development module were compared based on percentages of available points. Baseline scores developed from the 22 completed projects ranged from 11 to 25 percent. The 15 Move Illinois projects scored from 35 to 55 percent, with one Gold rating, 13 Silver ratings, and one Bronze rating. Now that Illinois Tollway has established a baseline performance and evaluated early Move Illinois projects, the agency will be evaluating and improving the sustainability of future projects that are part of this $12 billion capital program. The Tollway will also be making programmatic improvements identified through the INVEST System Planning and Operations and Maintenance module evaluations. Illinois Tollway institutionalized the use of INVEST throughout its processes and is now using INVEST on projects and programs to improve sustainability. Illinois Tollway developed current, baseline levels of sustainability that will allow the agency to measure future improvements. Illinois Tollway identified specific areas for sustainability improvements based on the INVEST evaluations. Illinois Tollway customized INVEST with Tollway specific supplements and criteria to meet its unique needs. Illinois Tollway has more tangible and measurable sustainability performance data to share with the executive board, stakeholders, and community.